SiyaQhubeka Forests, situated on the western shores of Lake St. Lucia in Northern KwaZulu-Natal (South Africa), is a partnership between Mondi, its black empowerment partners, the government and local communities. 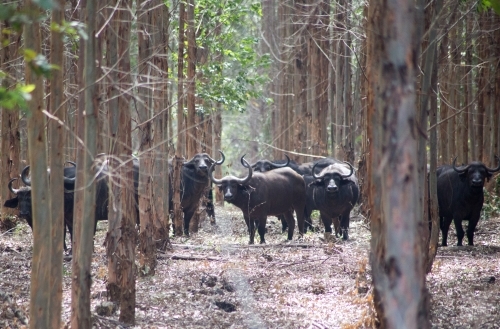 It was the first commercial organisation to delineate an accurate 150km long 'eco-boundary' line between a World Heritage Site (iSimangaliso Wetland Park) and a forestry plantation, successfully applying the thinking behind New Generation Plantations. In doing so SiyaChubeka Forests has transformed a long history of passionate dispute between local forestry operations and environmentalists into a true partnership. Mondi plantation areas and associated wetlands, natural forests and ecological networks have now become part of the iSimangaliso Wetland Park, and form the buffer between the Park, local communities and commercial farming areas. It has extended habitat that allows for species such as elephant, rhinoceros, buffalo, cheetah and other game to roam freely within the commercial forestry area. Today, both the plantations and the park are thriving enterprises, wetland areas have been restored to functionality and trust levels are high.